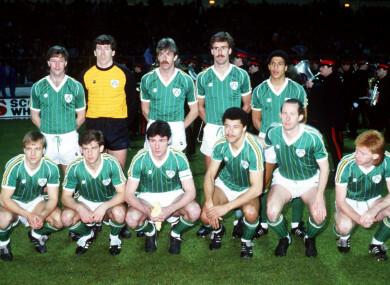 The Irish team pictured in 1985. THE FOLLOWING PASSAGE is an extract from First Hand: My Life and Irish Football by Eoin Hand with Jared Browne. I was unhappy that my term as manager of the Republic of Ireland senior team should end with the disappointing low of failed qualification for the World Cup in Mexico in 1986. Although I was proud to have been the Ireland manager, I must confess to feeling some relief, however, when it was all over. Unlike John Giles before me and all Ireland managers after me (with the exception of Brian Kerr), I lived in the country throughout my term as manager. I was not expecting a medal for this, but it meant that, as the results failed to improve, I could not get any respite from the pressure cooker of negative attention. In my last year in the job, I was regularly taking verbal abuse, much of it very unpleasant, from random members of the public. I remember, in one case, while managing St Patrick’s Athletic, how a Shamrock Rovers fan just walked up and spat on me. I inevitably became more cautious about my movements. Before I went out anywhere in Dublin, I had to think about it first. Certain places, unfortunately, became out of bounds for me. Even something as simple as going for a quiet drink with my wife became a potential nightmare. Although my home phone number was ex-directory, a handful of unhinged ‘fans’ managed to get hold of it. This led to a number of threatening calls to my house, usually late at night or in the early hours of the morning. Although I had tried to keep these calls secret from my family, I found out later, however, that they were aware of the abusive calls all along but, to their credit, they stayed silent and allowed me to deal with the situation in my own way. Whatever about the security of my home phone number, since I owned a sports shop for a part of my time as national team manager, I became easy pickings for the crackpots who wanted to have a go at me. These calls were obviously disturbing, but I decided not to bother reporting them to the police. I felt that if I took them seriously, I would have been ready for the asylum. The situation, unfortunately, affected my mother. If I visited her at her home in Drumcondra on a day when there was a big Gaelic football match in Croke Park, some of the yobbos passing her door would chant all manner of abuse, knowing that I was her son. Eventually, such a burden comes to dominate your life: it is what you think about first thing in the morning and last thing at night. A particularly unsavoury incident happened in Dublin after our scoreless draw with Norway in May 1985. The then-Southampton manager, Lawrie McMenemy, attended the game and, as he left the ground with me, the aggression and threats from a group of so-called fans became very serious. Lawrie was targeted because he was English. What really infuriated me about that day, however, was the fact that some of the Irish team were spat on as they made their way to the team bus. It was difficult to believe Dave’s words but he was right. In subsequent decades, wherever I have travelled in Ireland, I have met with only genuine generosity and goodwill from ordinary football fans. First Hand: My Life and Irish Football by Eoin Hand with Jared Browne is published by The Collins Press. More info here. Email “'Some of the Irish team were spat on as they made their way to the team bus'”. Feedback on “'Some of the Irish team were spat on as they made their way to the team bus'”.